We are engaged in offering Wheel forgings ranging from 200 up to 1500 mm diameter. The customers can avail Wheel Forging from us in different materials like carbon steel, Alloy steel, stainless steel and more as per their requirements. Our Wheel Forging is duly hardened and tempered as per the specific requirement. We are a Special Wheel Forgings Manufacture & Supplier in China. Size : 30 Kg upto 5 Tonne per Piece. Diameter : 200 mm upto 1800 mm. Material : Carbon Steel , Alloy Steel , Stainless Steel forged , Heat Treated , UT Test Level II. 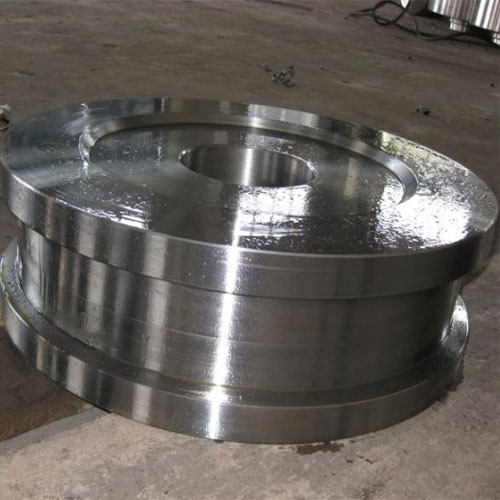 Sheave Wheel Forgings are available in a wide range of standard sizes. In addition, sheave wheel Forgings to meet your special design requirements can be produced in virtually any size, configuration and surface finish condition. We maintain a large inventory of carbon and alloy steels to meet your specific needs. Crane Wheel Forgings are available in a wide range of standard sizes. In addition, crane wheel Forgings to meet your special design requirements can be produced in virtually any size, configuration and surface finish condition. We maintain a large inventory of carbon and alloy steels to meet your specific requirements.